Click here to order gifts, apparel, promotional and event items, such as pens, pencils, buttons, tote bags and coolers, mugs, banners, shirts, hats, jackets, and much more. 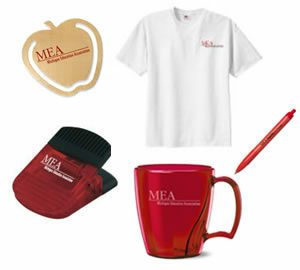 All items are union imprinted in the USA and can include the MEA logo or your custom imprint. If you can’t find what you’re looking for, contact Laura Hall at Laura.Hall@keystonemillbrook.com.